What if a fairy came by you and offered a lucky charm that can make you rich overnight? Well, in this slot game of Luck O’ the Irish Fortune Spins, there is no fairy but lucky Leprechaun ready to shower you with lots of luck. And with few lucky spins, you can definitely expect to get rich in just a few minutes. That is the kind of opportunity this simple five reel slot game offers. The slots game is set in the beautiful backdrop of a lush green countryside fields with a bright rainbow. The magical sounds when the reels spin is really mesmerising. You can place your bets here from as low as £0.10 to £500 per spin. Blueprint Gaming company is the developer behind this stunning fairy tale based slot game. With years of experience in advanced gaming technology, they have been successful in delivering world class slot games for the online users. 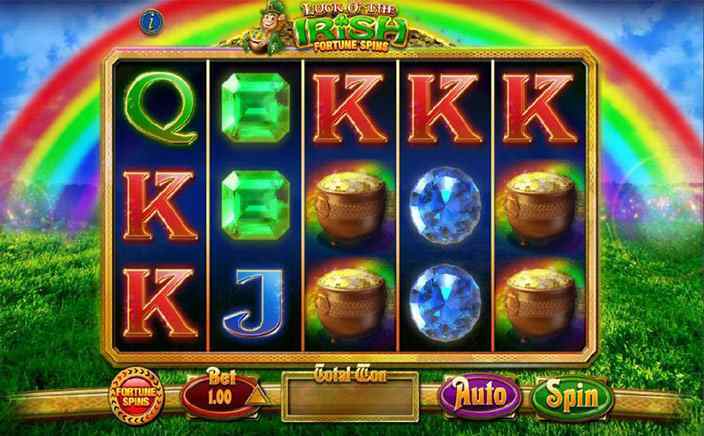 Luck O’ the Irish Fortune Spins slots is played with its attractive symbols such as different colours of precious gemstones. There is also a pot of gold that pays the highest stakes of 500 times on five of its kind landing during a spin. The lower value symbols are represented by playing cards from 10 to A. All these symbols pay you adjacent; that is when it appears across any three lines from 1st to the 5th reel. There is just one bonus symbol but that appears only during the bonus level. Fortune Spins Bonus Level: This is the second mode of Luck O’ the Irish Fortune Spins slots and is played with four different slots. The betting limit here is from £2 to £500 per spin. Once you place your bets, all four slots make a spin one-after-the-other. The bonus symbol which is the game logo appears in this mode to reveal a mystery symbol. Bonus Symbol’s Role: When this symbol appears on the first of four slots, it replicates an equal number of appearance on the other three slots. When the second slot starts spinning, the bonus symbols remain sticky and reveal into mystery symbols. This continues until the end of all four spins. On the last spin, all the bonus symbols from previous slots are accumulated and finally reveals into a top paying symbol to exaggerate your winning. 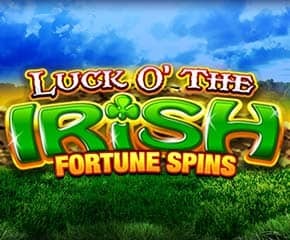 Luck O’ the Irish Fortune Spins slots is a simple game with the dual mode where you can enhance your winning by four folds with four individual slots. A unique gaming experience with mind blowing visuals and animation.